Sticking it to the Man—with cake! This morning I got up to see my new place. Mom and Dad arrived last night about twenty minutes before I got home. I found them waiting in the van outside an empty house. We unpacked the car, dragged boxes up the stairs, and then started to make dinner. Or rather, they did, because I was still very very sick. I managed to retain enough sense to ask for the housekeys back. I also managed to wake up this morning just as Stephen and his father were about to leave. I shook hands with them and off they went. Only later did I realise that they forgot to return the beer bottles in the hallway. Well, I guess that's another thing for us to do. After breaking fast, we drove to my new place and got the keys from the landlord. Waiting there were two guys who were going to clean the place in the morning. I presume that they should be done by now. The landlord promised me a new fridge, which I hope will be frost-free. As well, he promised to look at a broken electrical socket in the bedroom. Good. Dad and I looked about the place and we noticed a pile of boxes on the balcony. 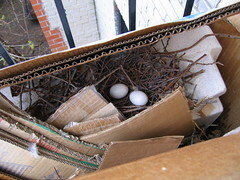 We moved some of them aside and saw a bird's nest sitting amongst the cardboard. Aren't the eggs so cute? After leaving housekeys to both places with Mom and Dad, I took the bus down to work. It was about 9:30 by this time so only dcoombs was around. I sat down and got increasingly frustrated at a chunk of code I cannot understand. Feeling that I was incompetent, I talked to pphaenuf about it. This culminated with a discussion with Avery which caused Pierre to cry. Not good. A couple of minutes ago, I went down to Complex Desjardins to pick up my Québec tax forms. I should do those some time soon so that I can collect my tax refund. I'll beleive it when I see it!